Images and other media files uploaded into the native WordPress Media Library are stored in the website’s wp-content/uploads folder. WordPress by default, automatically adds three versions of an individual image file. Website themes and some plug-ins may also generate additional versions of an image file for use as featured images and thumbnails. All of these uploaded files add to the website’s storage size. The native WordPress Media Library ONLY allows organization of uploaded content by date – with no sorting or filtering available by file name or by blog post, let alone any kind of a directory structure. In the screenshot below, the image_thumb.jpg had been uploaded to our blog’s native WordPress Media Library – and our WordPress installation and theme created 7 additional versions of the same file. It didn’t take long until this website’s database was bloated by images – which also affects page loading times as well as increasing database and backup sizes. Many of our blog posts are heavy with images, with anywhere from 5 to 60 images per post. The website backups grew from 40 Mg to over 250 Mg after only 20 blog posts – with no other functionality added via the theme, customizations and plugins that would have added to that increased size. So all that ‘bloat’ was from WordPress Media Library contents! If the website ever needed to be moved to a different location, all those extra upload files will likely complicate and extend the process. Solution: Move website images to Azure Storage! There are numerous WordPress Plugins and WordPress code tweaks available online to help with fixing the image bloat in the WordPress Media Library – but why bother when there is the simple, convenient, secure and inexpensive means of storing and delivering WordPress images and other media in the cloud using Microsoft’s Azure Blob Storage! 1. Direct Access to Blob Storage content using a hyperlink to the stored file/blob. The website is streamlined without embedded images, using only hyperlinks, allowing for easy moving of a website, faster page load times, etc. Use MASE’s convenient ‘CopyURL’ feature to capture the hyperlink for a stored image for pasting into post or page. Pasting the hyperlink into the Visual Editor view of a page or post, will instantly display the image, without having to select ‘Add Media’ or ‘Insert Image’ etc. This is the solution we use on our websites – no plugin required. It might still be necessary to upload some images to the website’s wp-content/upload directory for specific plugins that won’t process a hyperlink to deliver an image or other file type. For example, we use a plugin to create a Custom Login page for private websites, that only accepts logo images from the native WordPress Media Library. We have the same requirement for a website Feature Image by the theme we use. Allows using a custom domain using SSL if a Content Delivery Network (CDN) is configured to Azure Storage, instead of using long Azure domain. 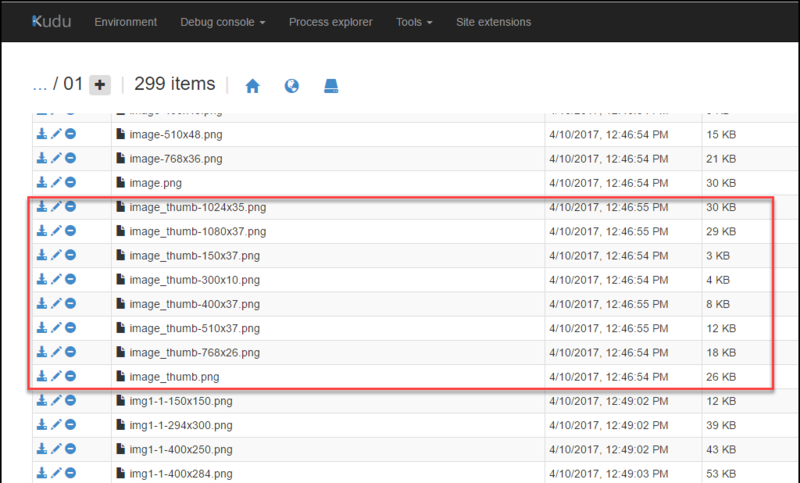 Uploads to Azure Storage via the WordPress uploader automatically create multiple versions of the same image – more if the theme or another plugin does the same! One more plugin to maintain updates for and use up platform resources. NOTE: It is also possible to setup an Azure Content Delivery Network (CDN) for even faster geolocation access of media files for the WordPress site, but we are keeping it simple and less expensive for the time being. A CDN can always be added as the next layer of delivery, if required. Configuring an Azure CDN will be covered in a future excerpt.